It’s an early Thursday night at the Towers in Centennial Square at SF State, where an unassuming set of stairs leads down to a small colony of hoodie-clad people huddled around enough televisions for a village. Most of the TVs in sight aren’t out of place in the modern age, but over to the side are the kind that were once relegated to Saturday morning cartoons—the old, boxy looking ones with round, glass screens. These relics are bright with the fuzz of Super Smash Bros Melee’s characteristically blown-out colors and energy-filled character barks. It’s these cathode ray tube TVs (CRTs) that sustain retro gaming, and that poses a great technical challenge for playing in the future. For San-Gabriel, Melee can be a tricky game to setup logistically due to its age. 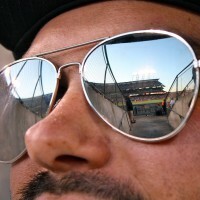 One main concern is that the game is played on CRT (cathode ray tube) televisions, or tube TVs in a tournament setting. Playing on a CRT gives the game a consistently better framerate compared to modern TVs, so for competitive gaming this can affect playability. But, it’s getting harder over time to reliably obtain CRTs since they’re no longer in production. That poses a problem going forward, exemplified as San-Gabriel points to a television set with a tiny bit of duct-tape on its top—its band aid after being dropped recently. CRTs in particular pose many problems, especially when it comes to The Academy’s larger regional monthly tournaments, which nearly double in size. In particular, San-Gabriel noted that the difficulty of obtaining these TVs, seeing as the tournament size can nearly double yet the amount of CRTs generally doesn’t increase because of storage limitations. What compounds the problem even more is that CRTs are getting harder to find over time, especially since retro gaming is one of the only few modern uses for them. 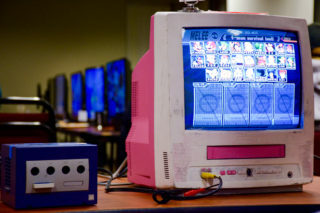 The older setups are also finicky, and that any minor flaws in say, a TV’s image, could make the setup “not viable” for competitive play, meaning that tournament entrants could be forced to wait even longer to play their games. Older games like Melee rely on CRTs because they have less lag by milliseconds compared to modern displays, which tend to process an image even further. It might not seem like much, but The Academy’s monthly tournaments involve an entry fee and for bigger tournaments, those few milliseconds could mean money lost. San-Gabriel is also quick to point out that major tournaments for Melee, such as the recent Genesis 6 in Oakland, also suffer from the same problem, where hundreds of tournament entrants can spend hours waiting for an open setup to play their tournament matches. 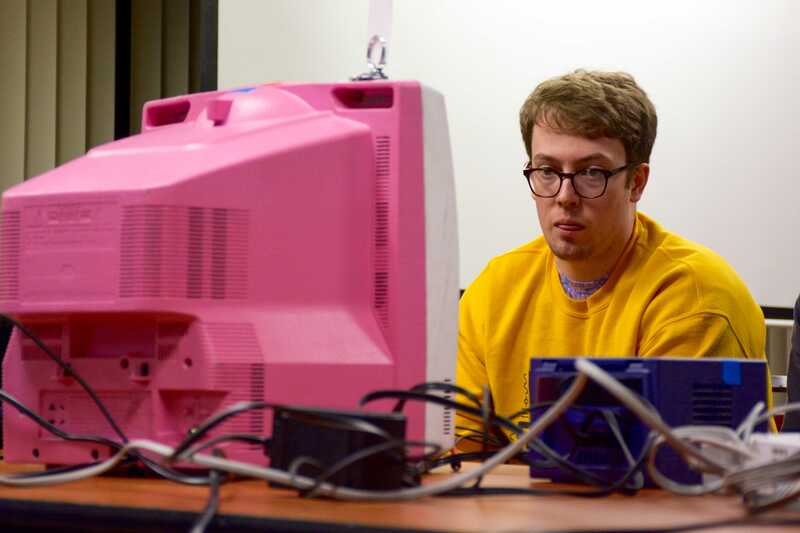 For Nick Green, a broadcast and electronic communications major and Melee tournament organizer, setup availability is the main problem for running a Smash tournament. According to the Film Foundation, a movie preservation group, about ninety percent of movies made before 1929 and seventy-five of silent movies are lost forever, meaning that there’s no way to view them in the modern age. Some fear that the same could happen to video games in the future, especially with Nintendo’s recent closure of the Wii Shop Channel on January 31 of 2019, which was an App Store-like digital marketplace for smaller, digital-only games. This signals problems for people that want to keep playing older games, whether for fun or gaming history’s sake. One of the organizations involved deeply in games preservation is The Museum of Art and Digital Entertainment (MADE) in Oakland. Nestled between a Honda dealership and a highway overpass, MADE is about a fifteen minute walk from the 19th Street Oakland BART stop. 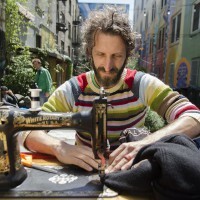 The MADE was established in 2011 by Alex Handy, who found an unreleased Cabbage Patch Kids game for the Atari 2600 from the eighties pre-installed on it. Handy shopped it around to other exhibits, but they wouldn’t maintain it or they wouldn’t make it playable. So he started his own museum using his personal collection, bolstering his collection with the archival collection of the now-folded GamePro magazine. The outside of MADE appears two stone lions and Roman-style columns, but inside lies a cornucopia of gaming consoles connected to small tube TVs. Overhead, fluorescent lights give off a faint, white glow that sparkles in comparison to the soft, almost fuzzy nature of the games hosted inside. For Evie Salomon, an employee at the MADE, games preservation is about getting as close to the original hardware as possible. Salomon got interested in games preservation as a child, since her dad was an electrical engineer and they would work on restoring old computer boards together growing up, which they still do to this day. Salomon likened it to working on old cars, where some things, like internal capacitors and integrated circuits, can still be similar to modern gaming consoles. There is a steep learning curve for gaming systems such as the Commodore 64, a computer that would require users to input specific commands in order to even start a game. Salomon points specifically to a Commodore 64 exhibit she’s worked on, which is set up to allow users to pick from a wide variety of games without having to type in specific commands or fiddling with physical cartridges. Chris Wolf, one of the MADE’s curators, sees games preservation as a way to paint games as more than just a form of entertainment. As a fresh college graduate in 2011, a neighbor mentioned to Wolf that he worked in the same building as the MADE. Wolf became a regular customer, and started working there shortly after its opening. Wolf elaborated on his curation process and how some games can elicit very different emotions, giving an example of Shadow of the Colossus and its visual style evoking similar visual styles to French impressionist paintings, or the wireframe art style of Marble Madness to M.C. Escher’s artwork. He also points out that he works on some of the pixel art that hangs in the MADE and sells some of it at the MADE’s gift shop. For Wolf, curating the MADE usually comes down to finding themes. While modern, often digital-only games like those found on the App Store are easier to play and access now, they’re also more likely to fall to obsolescence. For example, Apple removed support for 32-bit apps (essentially those made before 2014) with iOS 11 in 2017, meaning that roughly 200,000 apps, 38,600 of them being games, would be made unavailable almost overnight, without a physical backup to play them, according to 2017 data from analytics firm Sensor Tower. Online-only games also suffer. Developers can shut down a game’s servers, making them non-preservable without access to both the game’s code and the server’s code, which is not a simple task. In 2013, publisher Electronic Arts shut down the servers for the game Darkspore, meaning that it’s completely unplayable now, even if you have the disk. While the MADE isn’t fully able to include digital-only games, like those found on the Wii Shop Channel, in its preservation efforts yet, Wolf did say that it’s certainly not out of the equation. While Wolf isn’t able to say much more about the talks since they’re still in very early stages, Wolf is able to relay that Habitat’s preservation (download it here) relies on a homebrew server that is maintained by the MADE and a group of external volunteers using source code that the MADE was able to obtain in talks with the game’s creator, Randy Farmer. The Habitat project is still technically in development, but it is playable, and it’s a signal that it could get easier to preserve games in the future. Although the process proves difficult now, there are those out there willing to give it their all to preserve video games so that future generations will be able to Smash.